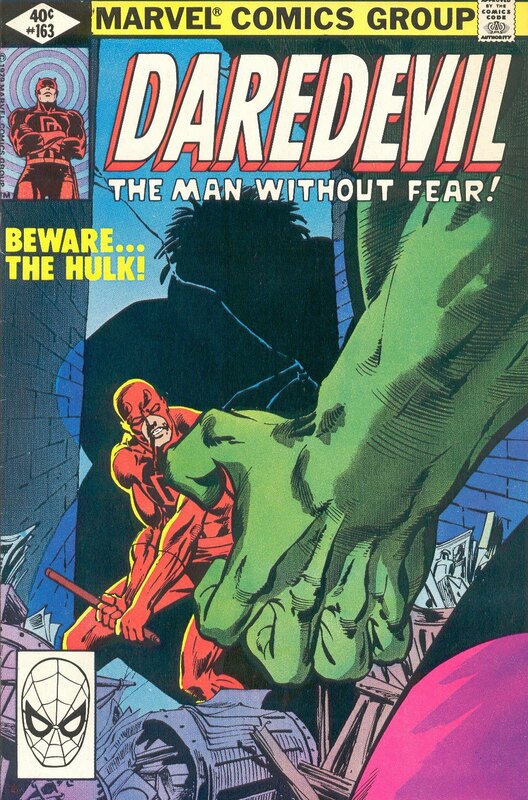 For anyone Daredevil vs. Hulk seems like a quick recipe for blind-lawyer pancakes. And while it pretty much is, this is also the issue where Ben Urich first deduced Matt Murdock's secret identity, but not before the mindless, rampaging Hulk figured it out first. In these days Daredevil was just ramping up. Roger McKenzie's scripts were been knocked out of the ballpark by Marvel's latest 20-something rising-star; artist Frank Miller and inker Klaus Janson. Only having recently joined the title, Frank brought with him a pulp-noir style and level of detail unmatched at the time. Kicking straight into round one, a plain-clothes Matt calms the monster he once defended in court, by asking for his trust in helping him find the source of his rage, Bruce Banner. While I always felt Bruce and Matt should hang-out a bit more, their plan to get the Hulk calmly beyond New York City proves even nuclear scientists can have an epic fail, as Banner opts for the subway. 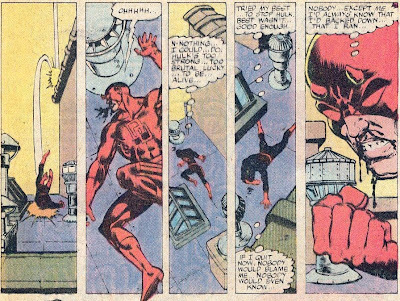 Lost in the hustle, bustle and smoke, Bruce's anger kicks in, activating his infamous change and round two for Murdock, this time as Daredevil. 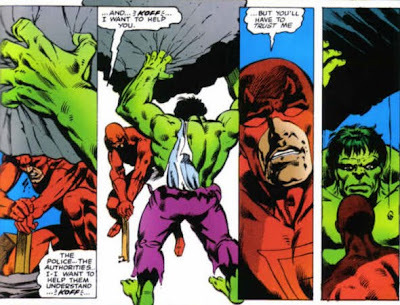 Attempting one last suicide gambit to reason with the beast, Matt throws his all into the battle and delivers the ultimate blow by explaining Hulk is actually Bruce Banner. Except it backfires. The Hulk's rage slips into overdrive and he slams ol' Hornhead for six. Just look at that again. That's the detail and expression of Frank Miller at the start of his career. Wow. Just wow. I love the little pebble falling in that last frame to - backing up the penny has dropped for the Hulk. How does the Jade Giant cope with the realisation of all he's done? Keep an eye out for Daredevil #163 'Blind Alley' to find out! DD also took on the Sub-Mariner in a very early issue of his book (#7 or something), proving Matt is no pushover! I'll say Rob - I love digging back into the reprinted Marvel books and seeing when the Sub Mariner would take on the heroes. He fought pretty much everybody. I love the cover to that issue too. The first appearance of Matt's infamous red suit, Wally Wood just did an awesome job on both. In fact I'll stick it up in the 'Classic Covers' sidebar this week so everybody else can check it out! I hadn't picked up on the peeble falling - that's a great visual clue! Yeah I love when the illustrators add those hidden kind of Easter Eggs Robert... and that's from a guy at the start of his career. No wonder people new he was going to be big.